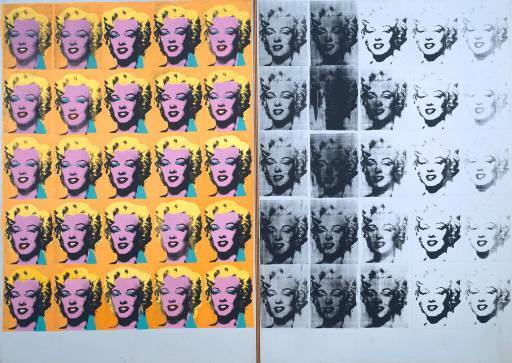 The above piece of famous art is the Marilyn Diptych, by pop artist Andy Warhol. Taking inspiration from this is Bon Yurt, a Colombian artist. Using only paint ball pellets and a team of paintball players, he sought to recreate Warhol’s portrait of Marilyn Monroe on a large sheet. Check out the results! See, it is possible to use your paintball skills for more than just a session of Halo LARPing! In fact, you can apparently use those skills to recreate famous art pieces in no time flat! That’s some really impressive grouping, great use of color, and a really cool take on a classic piece of American art. I think Warhol would be pleased, don’t you? Paintball used to be really cool for awhile, but all of a sudden it kind if disappeared. I mean, I know it’s still around, and I know people play it, but it’s been replaced by first-person shooter games online; kind of like how laser tag was replaced by paintball. I used to play it when I was younger, as some friends had an indoor paintball facility, but it cost a little too much for me to embrace it as a full-time hobby. Still, it’s a lot of fun, and seeing this video kind of makes me want to go pepper something with painty projectiles now!